luxe + lillies: BE MY VALENTINE? Valentines Day is right around the corner. Whether you have a special someone or not not... Its always fun to celebrate a holidays who's colors are pink and red! be mine 1. 2. 3. 4. 5[knockout pout, escapades]. 6. 7. xoxo: 1. 2. 3. 4. 5. 6. 7. What are you planning on this February 14th? P.S. Today I'm over at A Diary of Lovely sharing "My Stuff"! I love those nail polishes! Funny because I was about to paint my nails...I think I'll do pink this week to get in the spirit (: The shoes with the hearts are adorable, too! The ban.do shoe clips get me every time. They're so girly and fun! 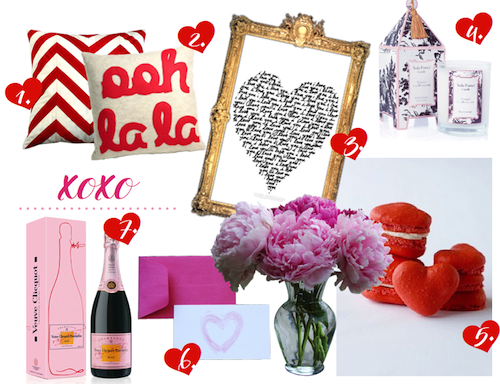 Oh my love the look of your site and these wonderful valentine inspired items! New follower from mutual blogger buddy Helena! Those flats are fabulous! Such a fun post! I spy Whoopie Pies! yum -- love all your choices! I spy whoopie pies!!! i love all your choices...have a great valentine weekend! Loving these vday picks! Especially the peonies and that pink essie polish! Love love love those darling throw pillows!